Votre amour sera toujours dans mon ciur. One of the most romantic countries in the world, France even displays beauty on their coins. The French Franc with Sterling Silver Lock and Key Men's Necklace is romantic, strong and powerful. The 10 Franc coin was minted from 1988-2001 and shows the Spirit of Bastille and is bimetallic (inner core is nickel and outer ring is composed of copper, nickel and aluminum). 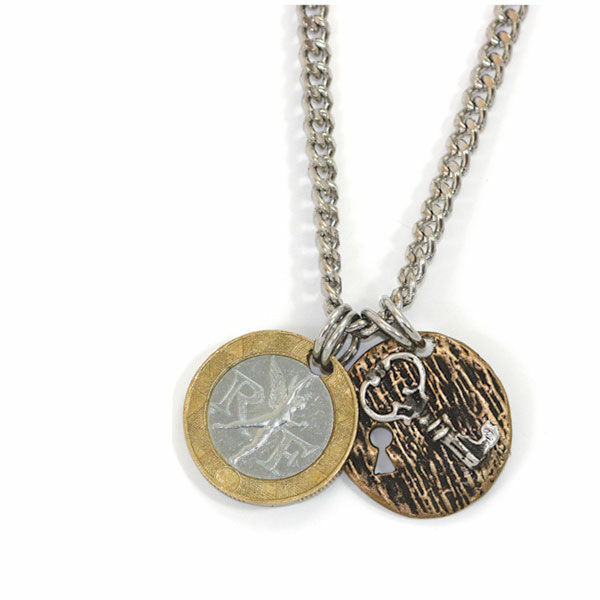 The coin hangs along side of a bronze disc with a sterling silver lock and key on a 24 inch silvertone chain with a lobster claw clasp. A Certificate of Authenticity is included. Allow 2-3 weeks for delivery. No rush delivery or gift box. Item can only be shipped within the Continental US.